Are You Trading....Crosby, Malkin or Staal? Are You Trading….Crosby, Malkin or Staal? not taken well to losing to their cross-state rival. Pens fans want some answers and they want some changes so they never have to experience the debacle that was the Pens versus the Flyers in the 2012 Stanley Cup Playoffs. Immediately following the series fans and the Pittsburgh radio airwaves were buzzing with suggestions for Penguins General Manager Ray Shero. While the Penguins finished the season with 108 points, Shero has plenty to think about this off-season. 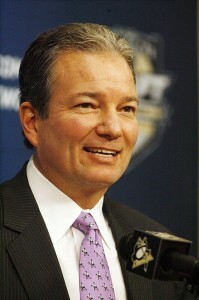 Shero has made it clear that Head Coach Dan Bylsma, and his staff, will be returning for the 2012-2013 season. Besides the fact that the coaching staff will be returning, everything else is in limbo. Until a new CBA is signed, Shero may not make any moves if he is able to keep patient. Shero has also admitted that he is still evaluating the 2011-12 season and the collapse that took place in the playoffs. Fresh off of the Pens losing in six games against the Flyers, Penguins fans had the audacity to suggest that the Pens trade Sidney Crosby. Many may wonder who the Pens would trade for if they traded away Crosby. There is absolutely no number of players or single player who would equal the services which Crosby has provided and will continue to provide for the Penguins. To even suggest a Crosby trade is ridiculous. Crosby scored 37 points in 22 games. He was one huge game away from averaging two points per game this season. He had 66 points and 32 goals in 41 games in 2010-11. His points per game average of 1.68 this season was higher than his 1.6 points per game average of 2010-11 which was unanimously considered to be Crosby’s best season as an NHL player. Anyone who has ever had to return from any type of injury can attest to the fact that there is nothing harder to do than come back and play at the highest level. Crosby could have practiced all he wanted, but there is nothing like playing in a game. Nothing compares to game speed. Crosby was nowhere near the level he will play at next season after finally getting a quality amount of games in under his belt this year. He represents more than just the Penguins. Crosby is the face of the NHL. Trading away Sid would run the risk of ruining the franchise despite the fact that Evgeni Malkin has done a fine job carrying the load in Crosby’s absence. After the Crosby trade talks lost their luster, the next developing rumor was that the Penguins should keep Jordan Staal and trade away Evgeni Malkin. There was also a different buzz started by an Edmonton Journal article written by David Staples. In the article Staples asked Edmonton Oilers fans if the Oilers should trade away their upcoming 1st overall pick for Jordan Staal. This created quite a stir in and around Pittsburgh. There were many Penguins fans who thought this was a good idea. Other fans felt the Penguins should keep Staal due to his playoff performance against the Flyers and trade away Malkin instead.Such suggestions are also ludicrous. The Pens are not going to trade away the NHL leading scorer and Hart Trophy candidate. Players like Malkin do not grow on trees. He was the best f0rward in the league this season and that cannot be argued. Gino was the only Pens star who was able to play the majority of this season. Don’t forget, Staal missed a handful of games this season with a sprained MCL and only participated in about half of the 2010-11 season due to a broken hand. Staal has not shown any durability of late. If something would go wrong with Crosby and his concussion issues next season, the Pens would be in desperate need of Gino’s scoring. Staal is not the type of player who can carry a team. 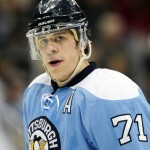 Staal is a great player but not of the same caliber of Malkin. Staal scored six goals in the series against the Flyers and lead the team in scoring in the playoffs. On the flip side, he only had one more point than Crosby and Malkin did in the series. For those who think he is ready to break out, Staal has always been an extremely streaky player. He scores in bunches and the Flyers series was six games of one of the most bizarre playoff series in history. In terms of Staal scoring more, he is like the last batter in a baseball line-up. The last batter sees all fast-balls, easier pitches and the pitcher unintentionally let’s up. Staal is never playing against a team’s top shutdown defensive pair or a team’s 2nd top pair of defenseman. These two top pairs of defenseman are always playing against Crosby and Malkin. Jordan Staal has scored more than expected this season, but he was also relied upon to be a defensive force. He was one of the anchors on the Penguins penalty killing unit which completely underachieved in the playoffs. Staal was caught letting Flyers’ forwards free and not playing his dependable defensive game like we have come to expect from him. All of this trade talk about the three Penguins stars is outrageous. The Pens should keep all three for as long as they can. Shero may not be able to sign Staal in the future and a trade may be warranted, but we are a long way away from that decision. Until then, let’s show some patience with the Pens superstars. After all, the defense is what needs to be improved the most. The Penguins scored enough goals to win the Flyers series. The Pens have no shutdown defensemen who play a gritty physical game capable of causing chaos for an opponent’s top scoring line. The Penguins have enough scoring and they do not need any offensive line-up changes as the top goal scoring team in the NHL. The only way they should consider making a blockbuster trade is if they can get a superstar defensive defenseman who can keep pucks out of their net. If this were an option, then Staal should be the first of the three superstars to be considered since 3rd line centermen are available around the league who can play defensive hockey. The window is closing on the Penguins to bring home a 2nd Stanley Cup with this young and talented group. They should keep the core forwards intact and not consider trading any of them. The Penguins should contemplate dumping some of their over-paid defensemen and search for cheaper paid defensemen who keep the game simple and play solid defense.